HomeArchived PagesEarly Labor Day Departures! 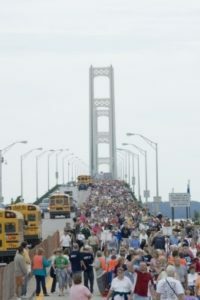 Skip long lines for the Labor Day Mackinac Bridge Walk! Take Star Line directly to St. Ignace. The ferry will be departing our Mackinaw City Dock at 6:30 am going directly to our St. Ignace dock. When you arrive in St. Ignace you can walk across the street and catch the FREE shuttle to the starting area. The cost for this departure is $15.00 per adult and $ 8.00 per child (ages 5-12). Children under five years of age travel free. No other discounts apply. We will also have a boat that leaves directly from our Mackinac Island Dock at 6:00 am for those on the Island that would like to get an early start! The cost for this departure is $15.00 per adult and $8.00 per child for a one-way ticket. Cost for a round trip ticket on the same departure is $18.00 per adult and $9.00 per child. Please call 800-638-9892 for any questions you have regarding our Special Labor Day Departures. Safe Travels!